1. Fry tortilla strips in oil until crisp; set aside. Bring broth, onions, and chiles to a boil in a 5 quart pan. Cover and simmer for 5 minutes. Add chicken and cilantro, cover and simmer about 5 minutes. Ladle soup into serving bowls; add lime juice to taste. 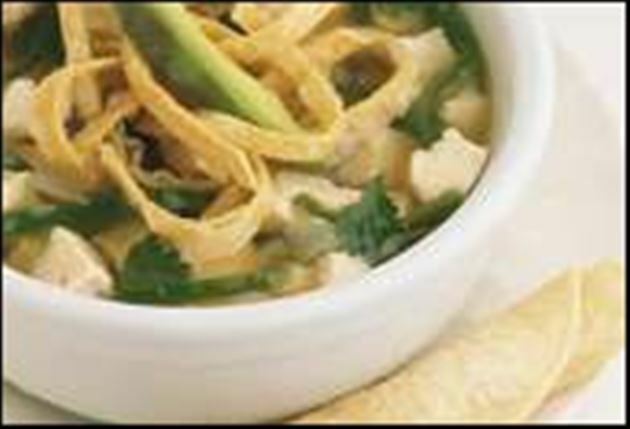 Divide tortilla strips among bowls. Garnish with sour cream and avocado slices as desired.